Saturday’s win at Carrow Road was Arsenal’s fifth straight Premier League victory and continued a fine series of games that has seen them look comfortable against teams who, a few weeks ago, commenters were saying they should be beating with ease. They managed to finally break down Stoke and edged past Bolton before easing past West Brom and comfortably beating Norwich at the weekend – whilst smashing Chelsea 5-3 in the middle of it all. An early Per Mertesacker mistake could have derailed Arsene Wenger’s side on Saturday as Steve Morison scored after 16 minutes but two goals from Robin Van Persie secured the points for the Gunners. Their last defeat came at the hands of rivals Tottenham at the beginning of October and, despite some defensive issues – Mertesacker should have coped better this weekend. Although, as many have pointed out, a shorter player could have dealt with the danger with more ease – the team, including the summer recruits, seems to be settling down. The only side in the League who are in a better run of form than Arsenal are the unstoppable Manchester City. Arsenal, in the 12 games they have played this season, have scored 25 goals: only the two Manchester clubs have scored more. Of course, a large proportion of those goals have come from one indomitable source in the shape of Robin Van Persie. 13, to be precise, taking the Dutchman’s tally for this calendar year to 31. Arsenal’s second top goalscorer in the League is Gervinho with two goals to his name. Such a fantastic record has lead many to go down the slightly ignorant route of declaring that Arsenal are a one-man team, if such a thing exists. However, Arsenal are reliant on Van Persie. Just as Liverpool are reliant on Luis Suarez and Manchester United are reliant on Wayne Rooney. It is also true that Arsenal would be a worse team without Van Persie; of course they would be. Look at any club in the world, take away their best player and they will indeed be a team that isn’t as good as they were before. But having one player who is the focal point of the team is not the same as being a one-man team, or even vaguely similar. Van Persie has 52% of Arsenal’s league goals – but then someone has to give him the ball to score those goals. Theo Walcott put in one of his best Arsenal performances on Saturday and is enjoying a fantastic season on the right-wing, while Gervinho – despite a wasteful showing at the weekend - looks a class act on the opposite wing. The attacking three behind Van Persie seems to be working well for Arsenal, with Aaron Ramsey also having a fantastic season. It is Mikel Arteta, though, who proves to be just as key to Arsenal’s side as Van Persie does. His ability to hold on to the ball and rarely give away possession (an average pass completion rate of 90.5% over nine games) is almost dwarfed by the amount of defence-splitting, key passes he makes per game (2.3). He may not be a direct and all-conquering replacement for Cesc Fabregas, but Arteta is proving himself to be a superb buy at just £10 million. Arteta has just the one assist this season but Gervinho has got five, with Ramsey getting four, as has Alex Song. More often than not Alex Song is usually viewed as something of a peripheral figure, sometimes a distinctly average defensive midfielder, but he's been fantastic this season and he was absolutely sublime against Norwich. Even players who were being ridiculed weeks ago are now showing themselves to be more than competent. Mertesacker clearly lacks pace but his ability to read the game at Premier League speed is improving and his robustness in the air is something that Arsenal have been craving for a while now, especially with Thomas Vermaelen continuously injured. The Belgian has now returned though and Lorient Koscielny also looks very impressive. Now all of a sudden, Arsenal have three excellent centre-backs. Add all of that to the fact that they also boast one of the best goalkeepers in the league in Wojciech Szczęsny and it makes the ‘one-man team’ argument look even more flawed. Arsenal, like every other football club, rely on much more than the goals of one player. But viewers of football see one player score lot of goals and equate that with him being the only player who does anything. But look at the fantastic team play and passes that lead to Van Persie's goals, without the sensational creativity of Arsenal's midfield and wingers, Van Persie probably wouldn’t have scored that much nor would Arsenal be on such a healthy run. 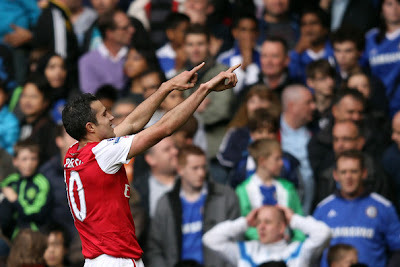 The goals Robin Van Persie has scored tell a story of a team, that are all working productively. Rather than showing a team with just one man performing.